Congratulations to our 2019 Rose Bowl winner Katie Kirkpatrick and our outstanding performer plaque winners Avenlea Cooper - strings, Katie Kirkpatrick - instrumental, Kaitlyn Bangs - piano and Briana Sutherland - vocal. Click on the link above for complete Festival results. The 2019 Festival took place from March 26th through April 5th 2019. Festival venues were Covenant United Church, Timmins Pentecostal Church and William Dawson Auditorium, Timmins High & Vocational School. 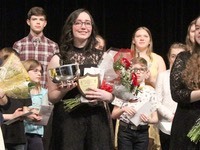 The Final Concert took place on Sunday April 7th 2019, 2:00 p.m., at the William Dawson Auditorium, Timmins High & Vocational School. 75th Anniversary Gala Cabaret Evening! On February 20th 2015 we celebrated the Festival's 75th Anniversary with an evening of fine food and music at the Porcupine Dante Club. 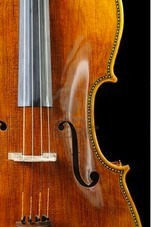 Welcome to the official website of the Porcupine Music Festival de Musique. We hope you spend some time and browse information about our Festival. 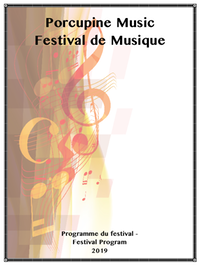 Now in its 79th year, the Porcupine Music Festival de Musique is our annual showcase of talent for which we are extremely proud. The Festival is truly a community effort and owes its ongoing success to the hard work and dedication of all those involved. The many volunteers, teachers, parents, scholarship donors and benefactors, and the energetic Committee members who devote their time to support and promote music in our community all share in its accomplishments.